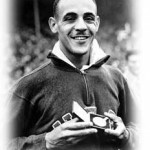 October 11, 1924 Malvin Greston “Mal” Whitfield, track athlete and diplomat, was born in Bay City, Texas. In 1943, Whitfield joined the United States Army Air Force and became a member of the Tuskegee Airmen with whom he flew 27 combat missions during the Korean War. After World War II he enrolled at Ohio State University where he won the NCAA title at 800 meters in 1948 and 1949. Whitfield’s most notable athletic achievements occurred at the Olympics Games. 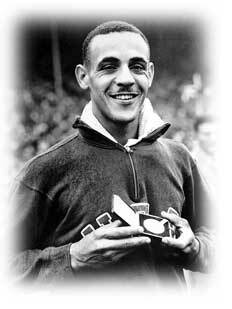 At the 1948 London Olympic Games he won Gold Medals in the 800 meters and the 4 by 400 meters relay and a Bronze Medal in the 400 meters. At the 1952 Helsinki Olympic Games he won a Gold Medal in the 800 meters and a Silver Medal in the 4 by 400 meters relay. In 1954, Whitfield became the first Black athlete to win the John E. Sullivan Award as the outstanding amateur athlete in the country. After graduating from California State University, Whitfield worked for 47 years for the United States State Department conducting sports clinics in Africa. During that time he trained dozens of athletes who represented their countries in the Olympic Games and he arranged sports scholarships for more than 5,000 African athletes to study in the United States. In 1974, Whitfield was inducted into the National Track and Field Hall of Fame.